In Interest Group Design, Marcie L. Reynolds examines the evolution of Common Cause, the first national government reform lobby. Founded in 1970 by John W. Gardner, the organization gained influence with Congress and established an organizational culture that lasted several decades. External and internal environmental changes led to mounting crises and by 2000 Common Cause's survival was in question. Yet fifteen years later Common Cause is a renewed organization, with evidence of revival across the United States. Empirical evidence suggests how Common Cause changed its interest group design but kept its identity in order to survive. 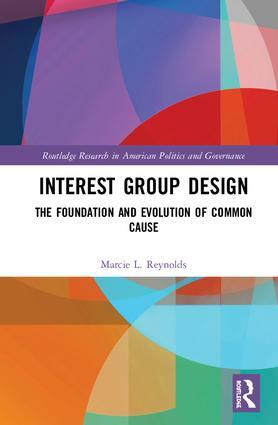 Utilizing a mixed-methods approach to frame and analyze the history of Common Cause, Reynolds provides a lens for studying how key aspects of the U.S. political system—interest groups, collective action, lobbying, and representation—work as environments change. She extends work by previous scholars Andrew S. McFarland (1984) and Lawrence Rothenberg (1992) creating a sequence of analytical research about one interest group spanning almost fifty years, a unique contribution to political science. This thoroughly researched and comprehensive book will be of great interest to those who study political participation and organizational change. Marcie L. Reynolds is a faculty member at Tarleton State University, Texas. Her research interests and community service center around civic engagement and increasing citizens' understanding of, and involvement with, the governing structures that surround them.